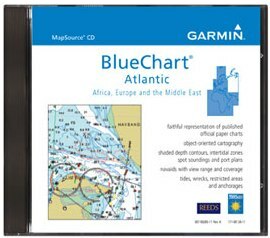 BlueChart cartography is Garmin's exclusive marine cartography. This line of cartography products is designed to provide interactive viewing of detailed nautical chart data, thereby providing navigators with innovative object-oriented cartography. These detailed electronic nautical charts look just like paper charts when displayed on your compatible Garmin chartplotter or handheld. BlueChart Atlantic contains updated coverage of Africa, Europe, and the Middle East including port services for Norway, Sweden, and Italy and detailed coverage of Iceland.